For most patients who’ve lost one or more teeth, dental implants can offer advantages for rebuilding their smiles that other, more conventional prostheses can’t offer. For example, traditional bridges and dentures might offer highly lifelike esthetic results and help prevent remaining teeth from shifting, all while restoring your bite’s ability to function. However, at our Encinitas/San Diego, patients who receive dental implants can also help stop many of the continuing effects of tooth loss that result from lost teeth roots. Before suggesting them, we’ll make sure that placing dental implants is a good idea by thoroughly examining the state of your oral health. Periodontal disease (or gum disease) is the most common reason for adult tooth loss. Therefore, many people who seek to replace their lost teeth still have gum disease to deal with, and the condition will continue eroding their gums and jawbone structure. That destruction can also cause dental implants to fail if the disease isn’t treated and brought under control before they’re placed. Even if you don’t have gum disease, your jawbone can gradually lose density and mass following the loss of your teeth roots. Traditional bridges and dentures do not address this lost, and therefore, jawbone erosion is often a significant consideration for patients who lost teeth long ago. For dental implants to be successful, you may need jawbone grafting to strengthen it enough to support your dental implant posts. The point of replacing lost teeth is to rebuild and reestablish a healthy, beautiful smile. If any of your remaining teeth are compromised by damage, decay, or misalignment, then your periodontist might suggest appropriate treatment to address the problem before you can receive dental implants. 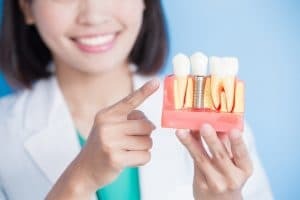 Dental implants can give your smile a tremendous boost following tooth loss, but your periodontist will first ensure that you’re a good candidate before recommending them. For more information, schedule a consultation with Dr. Kania by calling her periodontal office in Encinitas/San Diego, CA, at (760) 642-0711.